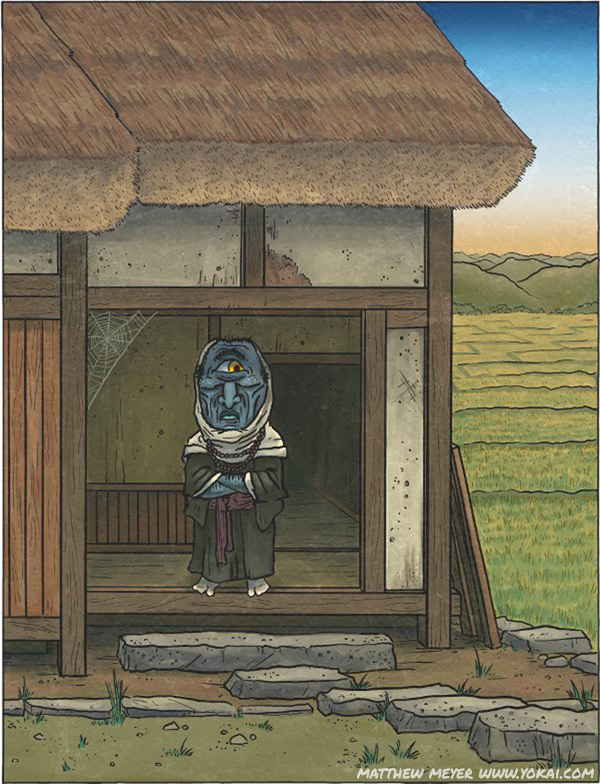 APPEARANCE: Ao bōzu are generally depicted as large, one-eyed, blue-skinned priests with a strong connection to magic. However, local accounts vary greatly in details such as size, number of eyes, and habitat. 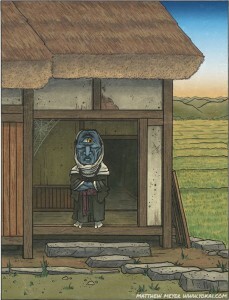 In Okayama, they are described as two-eyed giants who take up residence in abandoned or uninhabited homes. In other stories, they appear in wheat fields, or on dark, lonely roads. INTERACTIONS: In Shizuoka, ao bōzu are said to appear on spring evenings at sunset in the wheat and barley fields. The transition from night to day is a popular theme in the tradition of in-yō sorcery. Further, the still blue-green leaves of the young barley also have powerful connections to in-yō. Children who go running and playing through the fields in the evening might be snatched up and taken away by an ao bōzu. Thus, good children must go straight home after school and not go tramping through the fields! In Kagawa, ao bōzu appear late at night to young women and ask them, “Would you like to hang by your neck?” If the woman says no, the ao bōzu disappears without a word. However, if she ignores him or says nothing, he attacks her with lightning speed, knocks her out, and hangs her by the neck. ORIGIN: Very little is known about this yokai. Toriyama Sekien was the first to record the ao bōzu, and his illustration came with not a single word of description other than its name. From its name, we can glean a little bit of information; the word ao means blue or green, and can denote immaturity and inexperience. (Another well-known yokai — ao-nyōbō — uses this color in a similar manner.) As the original illustration was black-and-white, it may even be that this yokai was never intended to be colored blue or green, but rather just as a mockery of what Toriyama Sekien saw as a corrupt and unskilled priesthood. Nonetheless, thanks to its name, it is usually depicted in a sickly shade of ao.